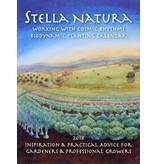 Biodynamic Planting Calendar: Planting Charts and Thought-Provoking Essays Edited by Sherry Wildfeuer Stella Natura has many aspects: a basic introduction to astronomy, a simple ephemeris, a planting guide, a star map, aid for following the movement of the planets in the night sky, and articles by nine different authors. All of these attempt to provide a true picture of the world outside us and ideas to assist in developing a healthy relation to that world. 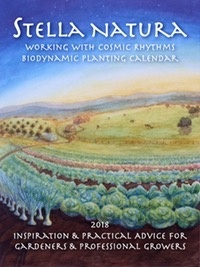 Sherry Wildfeuer notes: "This Calendar marks the beginning of a fifth decade of providing planting advice according to lunar and planetary rhythms. Explanations are for beginners, so no prior knowledge of biodynamics or astronomy is required. "The articles cover a wide range of subjects having to do with a healing approach to agriculture. I have written about the renewal of the Demeter/Persephone Mysteries, which gives an evolutionary perspective. Another author has described the remarkable healing power of the yarrow plant. Several people have described the process of beginning their farming, gardening and tree planting enterprises; another told in an interview how he is able to include people of varying ages and abilities in the work of a successful CSA. The voices of Wendell Berry and Thomas Berry sound through the experience of one writer. Another shows how Holistic Management can help balance the one-sided tendencies to be either a 'planner' or a 'doer.' A teacher shares his path from farming to introducing children to an experience of nature. A plant pathologist and arborist tells how he is exploring the way Rudolf Steiner's descriptions of elemental beings relate to his scientific training. And we are faced with the sobering effects of low level electromagnetic radiation on nature and human beings and offered advice on how to mitigate these influences. "My hope is that through timing the activities of your gardening and farming in harmony with lunar rhythms you will have a more fruitful harvest, and that the articles will expand the horizons of your thoughts and give inspiration for your own initiatives."